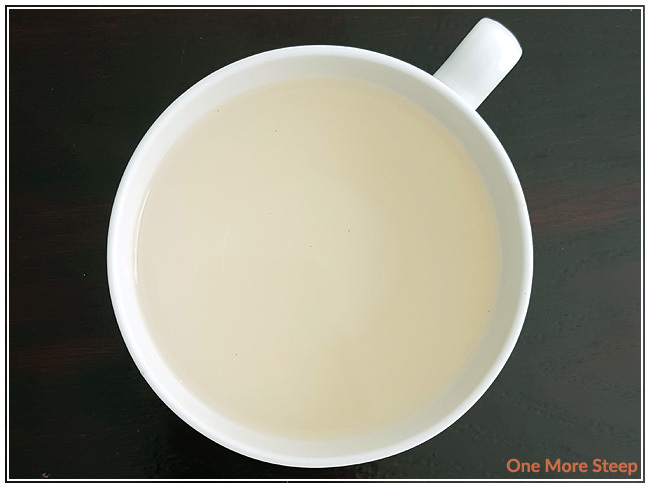 White Peony is a tea that I’m fairly familiar with – it is a tea that is often available with at the dim sum restaurants that I go with my family. It’s also called Bai Mudan (literally translates to white peony), for those who want to read more about it. 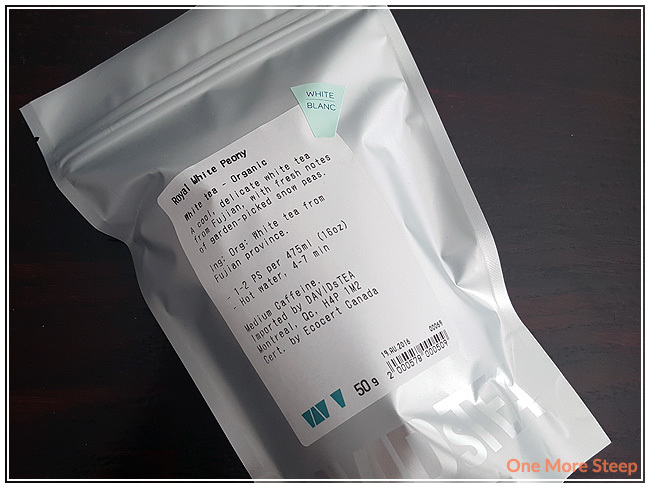 DavidsTea’s Royal White Peony is one of their newer straight teas – it’s a nice touch after them releasing many teas with additional flavourings/ingredients. DavidsTea describes Royal White Peony as a “delicate white tea” that has “fresh notes of garden-picked snow peas”. 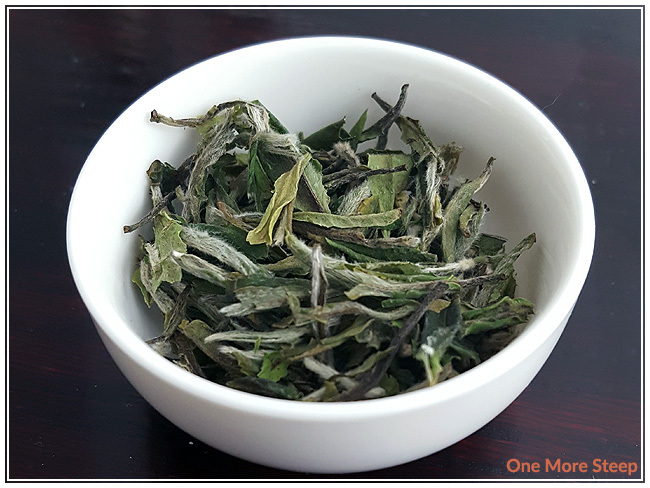 The dry leaf of Royal White Peony takes up quite a bit of space, it’s a light and airy tea that takes up a lot of space. The tea has a light floral scent, with visible feathery down on the leaves. I’m not getting any of the snow peas mentioned in the description of the tea, but I’m intrigued by it because I’m familiar with bai mudan. Royal White Peony is made of organic white tea from Fujian province. DavidsTea recommends steeping Royal White Peony in hot water for 4 to 7 minutes. Hot water is mentioned on their website as being 75-80°C (167-176°F). I used the green tea setting on my Breville IQ Kettle (175°F) and steeped the first pot for 2 minutes. White teas are steeped for 2 to 5 minutes, I find the recommended steeping times of 4 to 7 minutes to be much too long. Royal White Peony steeps to a pale yellow and has a very delicate floral scent. There’s quite a beautiful taste to this tea, there’s a natural sweetness with floral notes. 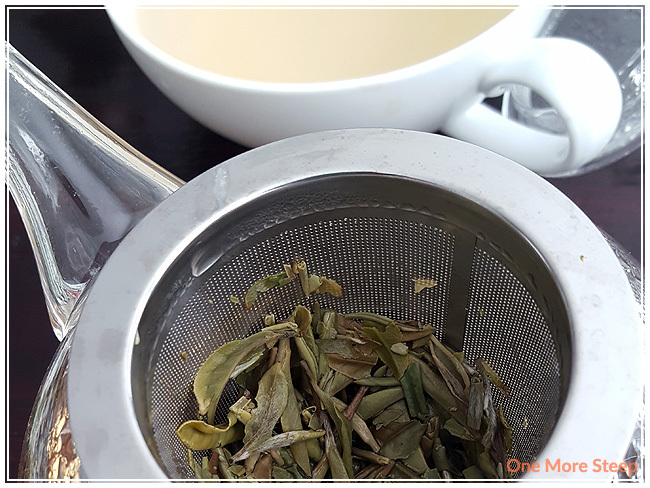 With the steeping time of two minutes, there is zero bitterness to the tea, a creamy texture to the tea, but also no taste or scent of the mentioned snow peas. It’s a very pleasant tea, I find that it’s easy to drink and I could easily drink this all day. I resteeped Royal White Peony a total of three times. I added an extra minute or so with each subsequent steep – the second steep was the deepest golden yellow colour. The flavouring of the second steep was the best as it had a deeper floral taste, although I am still missing out on the snow peas. I find that the third and fourth steepings were good but not as rich as the second steep. I loved DavidsTea’s Royal White Peony. While this isn’t an inexpensive tea, I do think that Royal White Peony does a great job of being economical. You get quite a bit of tea going by the weight, and the tea itself is delicious. I love that Royal White Peony resteeps well, and that you don’t need to use a lot for a pot of tea. 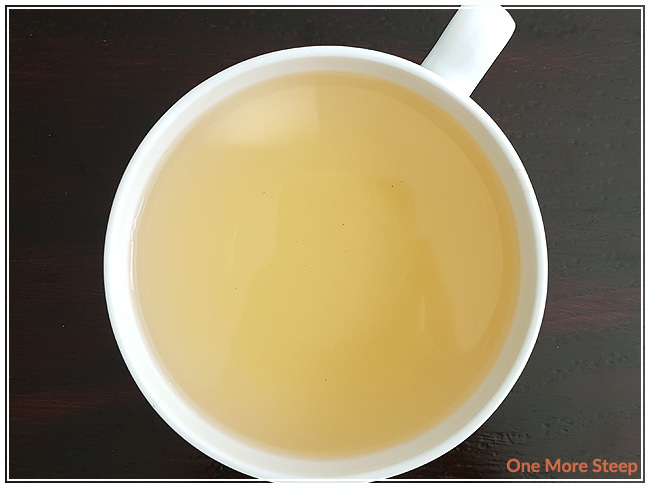 I always enjoy teas that can be resteeped well, and it tastes fantastic – huge bonus! It’s a nice every day tea, and the delicate floral taste to the tea would make an excellent tea to have with an afternoon tea or other sweets.